Got a Stroller Addiction? Join the Club! 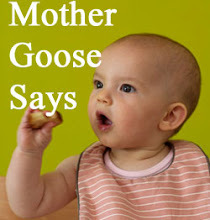 Yes, this is Mother Goose and I'm stopping by for (perhaps) my last post. I just wanted to let you know that the highly esteemed SOS will continue on without me and is currently in the process of electing a new president and/or board of directors. In the meantime, the SOS is going to take a nap. If you have questions, concerns, or suggestions, please email mommablogga@gmail.com. I don't know how to write this post. I've been praciticing it in my head for two weeks now because I knew it was coming. I gave my two weeks notice but I was in denial. I thought I could still blog for you. I can't. Given my recent poll and what you would like to see from SOS, however, I think this is for the best. I've taken the SOS as far as I can, now it's time for it to move on without me. So I have to say good bye. I didn't know I was going to get so emotional about this. My nose gets red and my face gets splotchy when I cry, so it's something I avoid doing in public at all cost. I nearly gave myself a migraine holding in the tears the first time I saw Titantic (come on, admit it. You cried, too.). So the fact that my eyesight is a little blurry right now should be an indication of how hard this is for me and how much you mean to me. I've really really enjoyed being the President of the Stroller Obsessed Support Group. It's introduced me to so many wonderful people and babies and strollers. I loved writing for you and to you, and I loved learning more about you and your families and your lives. It's been a real honor. Until now I've kept my personal life and my professional life separate, however, I do have a personal blog and twitter account. If you're interested in getting to know the rest of me, you can at my blog The Charmed Bracelet. Be forewarned: I don't run giveaways and I don't talk about strollers (not on a regular basis, anyway). I know. Soooo lame. But I do talk about writing. One thing I write is children's books. 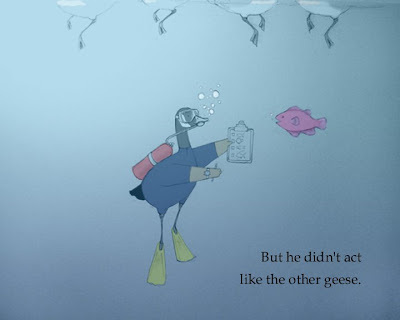 So in parting, here's an illustration that my twin sis did for our as yet unpublished book Howie the Goose. If you're so inclined, you can also follow me on twitter @JenniferWriter. Yes, Jennifer is my real name. Good bye, everyone. Thank you for being so warm and wonderful, so funny and real. I will miss you all. Candace is a gmum within the gDiaper community and has a unique coupon code that will save you some serious dough. At the same time you'll help her earn her way to a $100 gift certificate to use at gDiapers.com! gDiapers has come out with a new Everyday G's six pack! You'll get 3 orange and 3 vanilla bean gDiapers, including snap in liners and a swish stick. The 6 pack can be found at gDiapers.com for $70...But with Candace's coupon code (g1151trino) you'll save an extra $30!! That's 6 gDiapers for only $40! gDiapers typically sell for $16.99 a piece, so your saving over $60 by using the code above. This offer will end on July 31st! 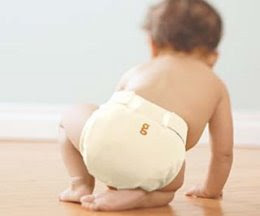 If your curious about gDiapers or have been hesitant to take the plunge, you can learn more at Candace's post about "How To Go Green With Your Poo" HERE! Thanks for reading, and thanks to Candace for sharing. Winner: Postcards From the Bump! While we're on the subject of Candace, you should check out her wonderful blog "Deal"ectible Mommies for tons of giveaways and deals. Candace, please email me at mothergooseblog@gmail.com with your address so I can send you this adorable book! 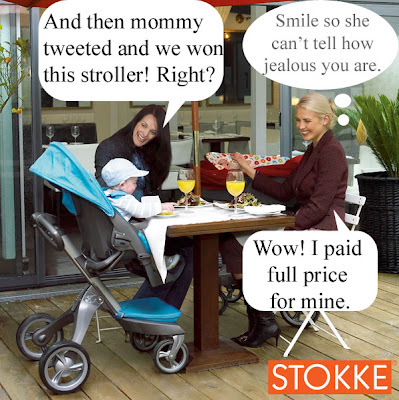 Tweet and Win a Stokke Xplory Stroller! Breaking news! Stokke is giving away an Xplory Basic Stroller (a $1000 value)!! Here are the details of the giveaway, taken from their site. * It brings your child up from the ground closer to you. 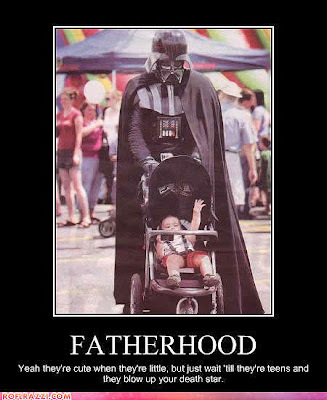 This helps create a bond between you and your child. * It comes with 3 year warranty. You can read all my previous posts about the Xplory here. Don't wait--enter this contest. What have you got to lose?? 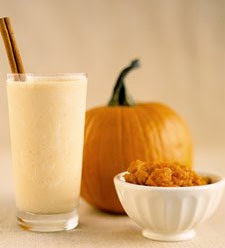 Blend all ingredients in blender until smooth. Sit back and enjoy! Yum!! Hungry for more? Then enter my Postcards from the Bump Giveaway! It ends tomorrow so don't miss your chance to win! (noun) a shifting series of hallucinations caused by the sight of a drool-worthy pram, in which one believes him or herself to own a pram. 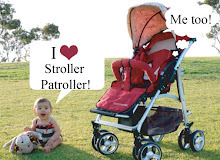 Momma Blogga is the blogger name for all the moms who guest blog on Stroller Patroller! If you want to contact one of the moms, just use MommaBlogga@gmail.com and the email will be forwarded to the appropriate mom. I Think I Fell Off The Planet… AGAIN!